Thats easy peasy ! 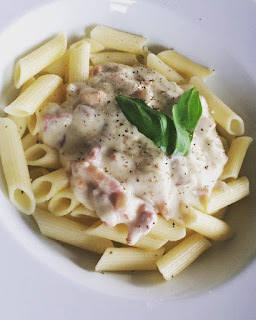 : CHICKEN & HAM PASTA "CREAM SAUCE"! Hope you're week is treating you well and are looking forward to the weekend! In our house, pasta in "cream sauce" (even though no cream is used!) is a major hit and a great treat. My creamy sauce for this dish is a bechamel sauce to which i add a little sneaky ingredient! Today i cooked it with gluten free pasta and cornflour, making it a great gluten free option. It really is simple to make but have all your ingredients ready and at hand as there are a few steps going on at the same time! Prepare water for pasta by boiling it up in a saucepan, adding a drop of oil and salt to season the water. Add pasta to boiling water and simmer for about 8 - 10 mins. While that's going on, fry off some chopped up chicken in a little garlic oil in a pan over medium to high heat, adding sea salt and black pepper to season. Cook for about 5 minutes and add some bacon bits cooking for a further 5 mins. Add a little drop of water to the pan if it starts to dry off too much. Ensure chicken is cooked through. In the meantime prepare your bechamel sauce. Add 2tbsp butter to a skillet over medium heat and let melt. To this add 4-5tbsp of cornflour, whisking. Mix over the heat for about 2 minutes. To this add 200ml milk little by little, whisking to ensure no lumps form. Once it starts to boil up, turn down to simmer for a couple of minutes, whisking in more milk if it thickens up too much. Add salt and white pepper to season. Once the bechamel is ready, remove from heat and stir in 1/2 tsp nutmeg. You are now ready to assemble your pasta dish by adding your chicken and bacon to the bechamel. Stir until all combined and spoon over the drained plated pasta. Large glass of chilled Pinot Grigio optional!